28 before 29, #10: Kyra Gaunt, Ph.D. Welcome to the tenth installment of an ongoing series leading up to my 29th birthday in which I ask people what their lives were like at my age. Three years ago I attended a day of workshops hosted by All Day Buffet’s The Feast in New York City. Kyra Gaunt was by far the best facilitator I encountered that day. Her session was called “Racism as a Resource: How to Agree to Be Offended” and she kept the dialogue productive, honest, and on track. Kyra’s website doesn’t have a traditional bio on the “About” page; she simply quotes James Baldwin: “I am what time, circumstance, history, have made of me, certainly, but I am also much more than that. So are we all.” Kyra is much more than her @kyraocity tweets; more than her book, The Games Black Girls Play: Learning the Ropes from Double Dutch to Hip Hop; and more than her TED Fellows talks. But if you’re intrigued by the interview below, I hope you’ll take a look at all of those things. K: In graduate school at University of Michigan pursuing a doctorate in voice. K: Looking over the timeline for that year, I don’t clearly remember Mandela’s release though I was an advocate fighting against Apartheid in grad school. I do remember the Exxon Valdez oil spill and thinking how disastrous it was. I was aware of what was happening in Nicaragua under President Bush and was against it. Universities are sites of great info and talks on these kinds of things. I remember heated conversations about Driving Miss Daisy and racial backlash to black actors as drivers and maids in black grad circles. And Mappelthorpe and the NEA was the big controversy of the year. I watched every night with amazement as a war from Gulf was televised and was sickened by the spectacle of killing people from afar and amazed. The fall of the Soviet Union was pretty shocking since I grew up in the duck-and-cover generation. Overall I was deeply entrenched in singing and trying to get a doctorate in classical voice while I was interested in singing jazz. Singing in an academic context wasn’t ideal for me. I got involved with a lot of grad students outside the School of Music at Michigan and participated in the Students of Color of Rackham org, celebrating and fighting for a university wide holiday on MLK Day which came I think that year to U of M. Also helped to form and organize the National Black Graduate Student Conference at Univ of Michigan that year. K: Far away now. Took something to jog my memories. But it was over 20 years ago. K: Honor your commitments to your biology and what inspires you first and foremost. Take care of your body and mind. Slow down. 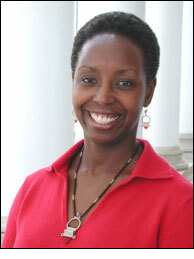 The photo of herself a few years later is courtesy Kyra Gaunt, Ph.D. This entry was posted in People, Projects and tagged 28 before 29, Kyra Gaunt, music, organizing, saturn returns. Bookmark the permalink.